As one of the riders of the first Race around the Netherlands (RatN), I’ve been asked by a couple of this year’s riders for some hints/tips about riding RatN. Here are a few thoughts on cycling RatN, they are primarily aimed at RatN racers, but they are may be useful for those undertaking long distance cycling in the Netherlands in General. This is primarily aimed at non Dutch competitors, but it may be useful for everyone racing. The Netherlands primarily uses the Maestro payment system (Pin/pinnen), most places that accept Pin, do not accept visa or MasterCard. Including the Visa debit card issued by most UK banks. Just because you see a card machine or “Pinnen, ja graag” sign, don’t expect to be able to pay with your UK card. Carry some cash as a backup, but be aware many places along the route are going to be Pin only. Touristy places and Hotels are likely to take your UK card, but don’t rely on it. Cash Points/ATM’s should accept your Visa/Mastercard. You’re likely to get hit with horrible charges (from your bank rather than from the machine), but it should at least work. Increasingly Dutch petrol/gas stations are automated, just because you see a gas station on the map, doesn’t mean it will serve anything other than fuel for cars. 3) Stuff tends to shut early. I find it can be hard to find food after 2100 in much of Rural Netherlands. The Dutch also don’t seem to eat Breakfast out, meaning it can be often hard to find somewhere to get breakfast before 0900, and in Rural villages, you’ve got no chance. Brits talk about the weather, but the Dutch Know the weather. 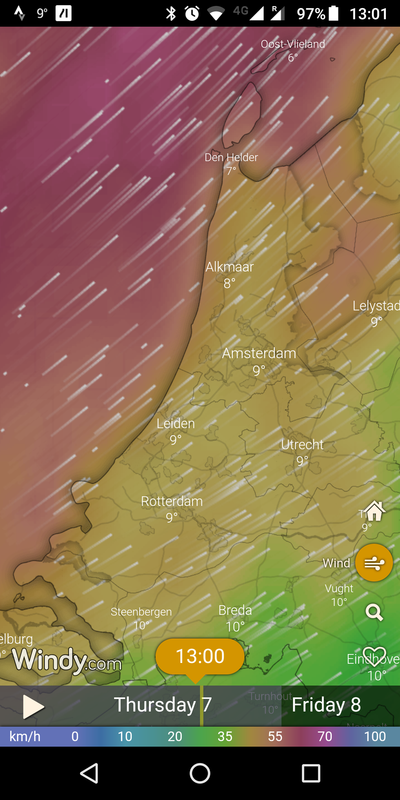 Ask a typical Dutch person what the weather is likely to be for the day and you’ll get an answer like “It’ll rain between 3 and 4, wind from the north force 3”. 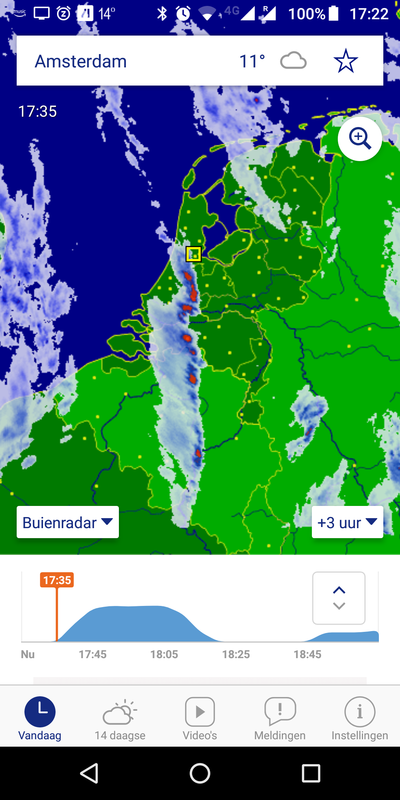 Install the Buienradar app, this gives you live radar as well as predictions for the next 3 hours. You can rely on this for knowing when it’s gonna rain to within a 10 min accuracy most of the time! For an idea of wind conditions, get the windy app, this gives really useful and accurate wind forecasts for the next few days. 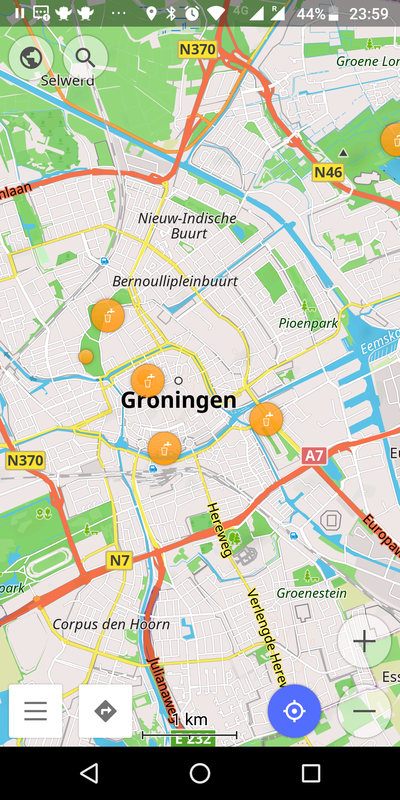 Coupled with the Buienradar app, the two should really help you keep ahead of the weather. Drinking water taps are pretty common in .NL, but finding them is not always easy. If you install the OSMand app, and turn on the drinking water POI layer, this will show on the map where all the drinking water points are. This is very useful in hot weather. Particularly when on the leg south from Den Helder to Rotterdam, and especially around the Tulip fields. You’ll find a lot of the cycling equivalent of Sunday drivers, give them a wide berth when over taking, and expect them to be wobbly when starting at junctions. In the big cities the locals have a very relaxed attitude towards red lights, they may not be expecting you to stop for a red. I’ve had cyclists ride into the back of me when I stopped for a red light and it took them by surprise. When you get to Zuid Limburg, you’ll find a lot of e-bikes. Struggling up the Cauberg and being overtaken by Oma and Opa on e-bikes isn’t uncommon. The weekend before the race is King’s day. Which is a nationwide party. Unfortunately, this tends to result in a lot of broken glass in the cycle paths. There’s not much you can do about it, but it’s worth knowing, and packing enough spare tubes. The Dutch love their block paving. It’s not quite Roubaix Pavé, but it’s also a long way short of smooth Tarmac. I’m running 32mm tyres, I ran 28mm last year, I’d hate to go narrower. Most bikes in the Netherlands are City bikes, and most bike shops cater accordingly. Just because you found a bike shop on Google maps, don’t necessarily expect them to have an inner tube for your 25mm tyres, or a spare Di2 cable. It’s also worth noting that the most common tyre valve on Dutch bikes is what the Brits call ‘Woods’. 9) Ye gods the wind. Did I mention the Dutch headwinds? Aerobars are your friend. Even the locals have them on their city bikes. Good luck! See you in Amerongen! Recently the Global Cycling Network’s YouTube channel did a segment on should we be fighting for the local bike shop (the Gcn show)This follows on from a recent episode of BBC 5 Lives Bespoke Weekly podcast about the joy of the Local Bike Shop (LBS). Across all of those talking about it, something struck me in their rose tinted analysis of an Aladins cave of cycling wonder that acts as a gateway for many of us. All the voices I heard were male. I recently knocked my rear wheel out of true. Whilst I do nearly all the maintenance on the bike I built myself, myself, wheel building and truing is an art I have yet to get the hang of. So I cycled 15km across Amsterdam to a bike shop on Ijburg to have it sorted. I sat in the comfy chair in the corner of the shop while Stephen worked his magic. While he tweaked the spokes one by one we chatted. It was like there was an audible click of realisation. For many male cyclists you never experience the inherent sexism in the cycle industry. But for a woman entering a bike shop it is often not a pleasant experience. If you’re lucky enough not to be hit on by the staff, you’re unlikely to get treated as a fully valued customer. If you can get them to realise you’re not lost, and you really are a cyclist, you then have to hope that the guy you’re dealing with doesn’t think you’re a moron and tries to sell you either the wrong thing, something you don’t need, or over charge you for work you “need” done on the bike because they think you don’t know better. This is often a similar experience for women taking a car to the garage. But even if you’re lucky enough to get passed all of that. You then find that the ladies jerseys are all in pink and they only have mediums or smalls… that the ladies specific bikes they have for you to try are a token gesture at best, and that’s before you get into the inherent female-unfriendly nature of bike sizing. (I’m 1.7m tall. This puts me 50mm below average height for men, and 100mm above average height for women. The bike I built has a size small Genesis Vagabond frame, the smallest they do. If someone who’s taller than average has to use a size small, what on earth do average height or shorter women do? But that’s a whole different rant). We hear a lot about the allure of cheaper components and gear from online retailers like wiggle, or bike24.de, but what is overlooked here is that I can order a 11-34 cassette and a 40-28 chainset without some guy who thought I was lost when I first came in, looking down his nose, questioning, and judging me. Don’t get me wrong. We need local bike shops. They are an incredible resource we should support and cherish. But only if they value, support and cherish their customers. And that means all of their customers. Including those from minorities (if you don’t think women are a minority in cycling, I’m signed up for a sportive ride where only 8/308 riders are non male!). The relationship a rider has with their LBS is an important one, and like all relationships, it works both ways. It’s Christmas eve, and the night before I head off on a big bike packing adventure. I’ve let off a kit grenade in the living room and am methodically rearrange kit into piles for each of the bags on the bike, one for the front, one for the frame bag, and another for the saddle bag. Each pile grows far bigger than the volume of the bag it’s intended to go on, and one by one I pick up each item and ask myself “Can I do without this?”. It’s now the second time I’ve gone through the piles of kit, each pass being more ruthless than the last until I’m happy I can get everything in the bike bags. I carry 3 crates of stuff down to the bike and humming the Tetris theme in my head, have a 3d game of tetris with the stuff I’m taking. Trying to work out a balance between making everything fit, and having stuff accessible in the order I’ll need it. As I close the final zip, sealing in the food, clothing and shelter for 5 days of winter bike packing, something said on a podcast enters my brain and I can’t shed it. “When packing for a trip. You end up carrying your fears”. I can’t remember now which podcast it’s from, either the Paul Kirtley podcast or the Tough Girl podcast, but as it sit there looking at my bike I say it out loud. “You end up carrying your fears”. 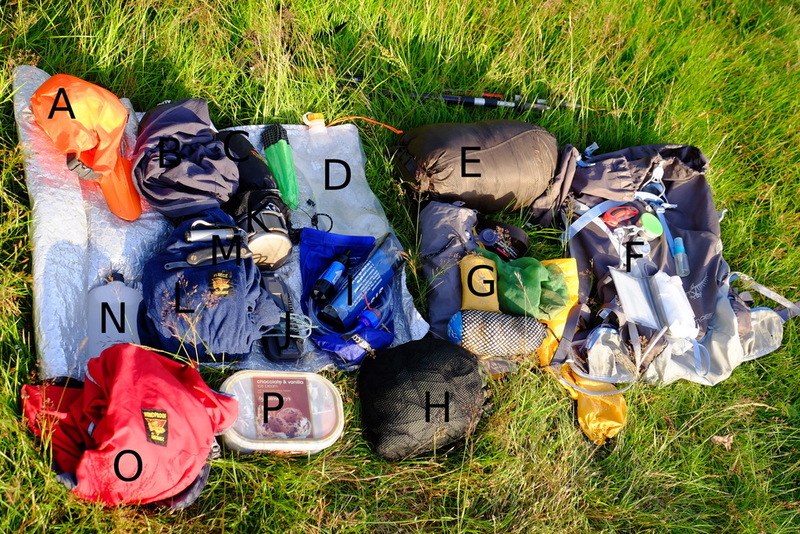 In this light I go over my packing list in my mind once again. What fears am I carrying? Getting lost isn’t one of them, other than my phone and the bike gps I don’t have any mapping. Not fearing dirty, smelly clothes. I’ve got just one set beyond the one I’m wearing. So what is taking up the bulk of my bags? Food, water, sleeping bag. The later fills a 13l dry bag on the front handlebars in its own right. 990g of down filled goodness, light, but bulky. 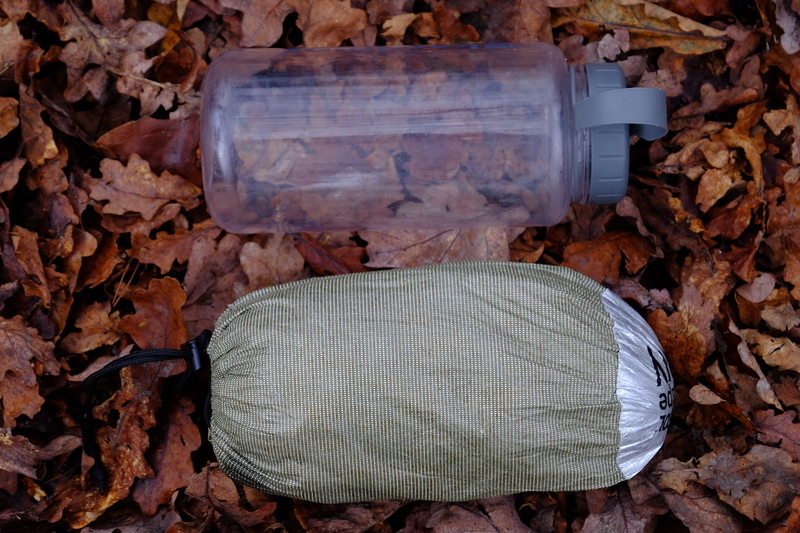 There’s also a 5l dry bag on the fork dedicated to my Paramo Torres insulated jacket. I’ve had hypothermia in the past, it’s not fun, and both consciously and unconsciously I’ve definitely packed to prevent it. On my Brompton trip in Luxembourg a few years back I had really bad dehydration and heat exhaustion that resulted in aborting the trip at the halfway point. I’ve got 2.6L of bottles and a further 900ml in a water bladder. It’s bulky, it’s heavy. Maybe I can get away with less, but do I want to risk it? So food? My adventure starts on Boxing day (26th December) and the plan for the first day involves cycling across the Ardennes, day 2 I enter Luxembourg, in theory it’s a normal business day, but experience tells me that shops in the Grand Duchy are few and far between. So I carry more gorp, a Christmas cake, extra mars bars. Even now doing the maths I know I don’t have enough calories for the amount of effort I’m expecting to need. 100km a day adds 2500+ to the recommended 2000 calories baseline for an adult woman. 4500 calories is about 18 mars bars. I have six, one per day, and one as emergency anti bonk rations. I’m gonna have to rely on my ample internal resources to have enough energy to make this work. But still my frame bag is just food. 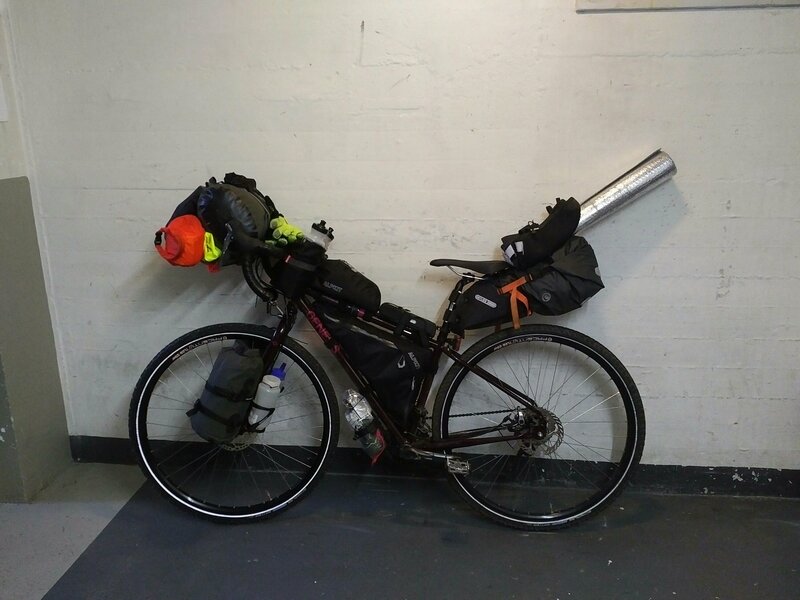 There’s a 3l bag on the handlebars with food, cookset and eating implements. The food is second to the water in terms of weight. My fears are heavy. My fears are hungry. So I sit here, looking at my bike, loaded with everything I think I’ll need, everything I fear I’ll need. And hope it will be enough. You carry your fears. Fear is heavy. That rare confluence of a British bank holiday and a good weather forecast offered an opportunity that seemed to be too good to miss. In particular the forecast showed a promise of a relatively warm night time temperatures (over 5°C). This seemed like a good chance to put the winter sleeping bag away, break out the summer kit and hit the trail. The North Downs way looked like the obvious choice. At this point I had a couple of gaps on the route at the Eastern end. One from the Battle of Britain Monument to Postling (courtesy of my first aborted attempt), and one from Dover to Canterbury. My GPX of the route showed that Dover to Canterbury was 30km, with a nice break in the middle around Shepherdswell. I threw some kit into my pack, opting at the last minute to add my Páramo Torres jacket in case it was slightly colder than planned, and headed for the station. 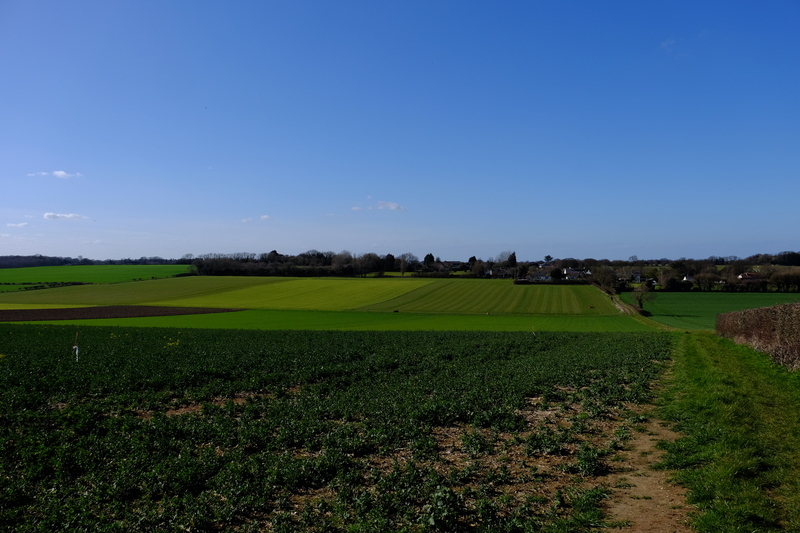 The Start/Finish of the North Downs Way (the shiny line in the middle of the picture). For anyone else hoping to find such a point I saved a waypoint into my GPS – 51.122521°N 1.315339°E (or TR 32098 41142 in OS Grid). Having found the trail I followed the first NDW sign through an underpass into the bustling heart of Dover’s high street. Here I promptly lost the signs again, and with not enough detail on my 1:40k map, I wandered round to Pencester Road, where I finally picked up the trail again. Here the sign was more obvious showing where I should have gone. 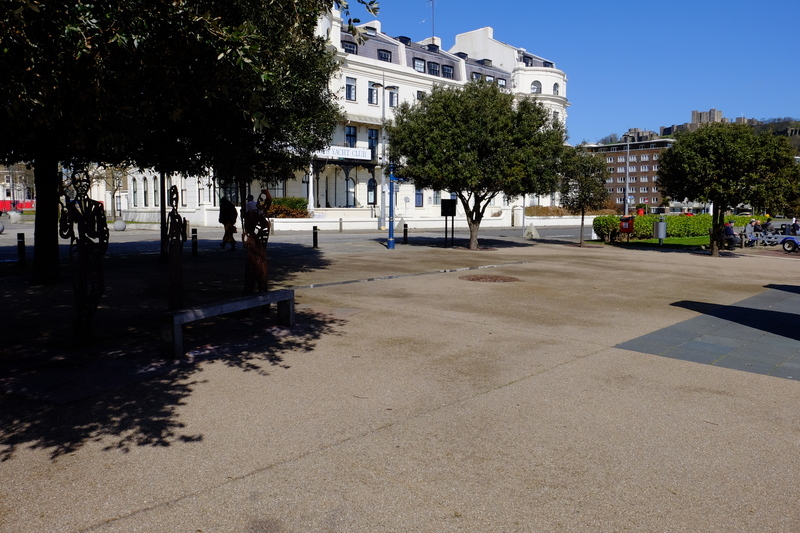 I followed the signs through the wide streets of Dover, the route showing a gentle incline. Here and there signs of spring poked through. Daffodils, Blackthorn blossom, Hazel catkins. I left the streets on Connaught road and followed a sunken path through a grave yard to join the old Roman Road, that climbs the hill out of the Valley and left Dover proper. By now the sun had come out and the it was warming up into a pleasant spring day. Alas there was a slight chilly breeze so I wasn’t able to lose my windproof. The first part of the path towards the A2 has recently been resurfaced and was rather pleasant to walk along with fields on each side. Like much of the North Downs Way you can’t get far from the sound of traffic and as I headed north the sound of the A2 got louder. On the OS map the North Downs Way is shown as crossing the A2 directly near what is now a slip road, but the Harveys Map and the sign posts show a detour to cross the A2 at a bridge. 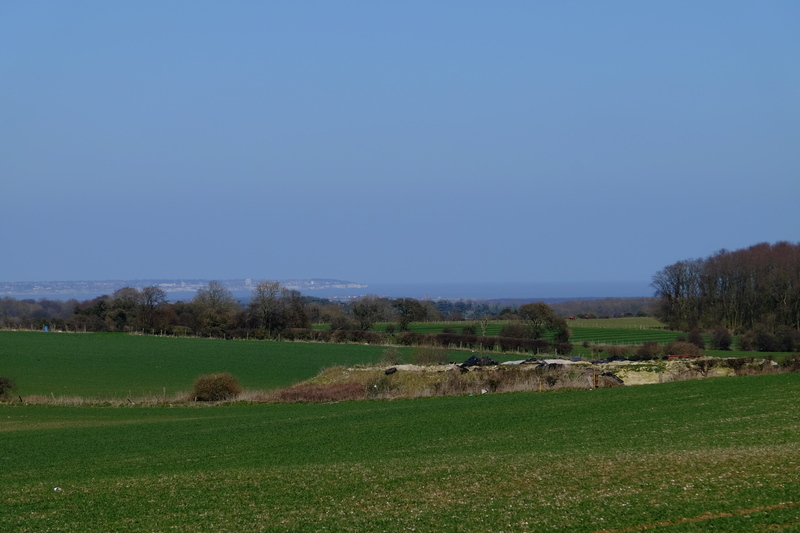 Ramsgate and the Isle of Thanet in the distance. 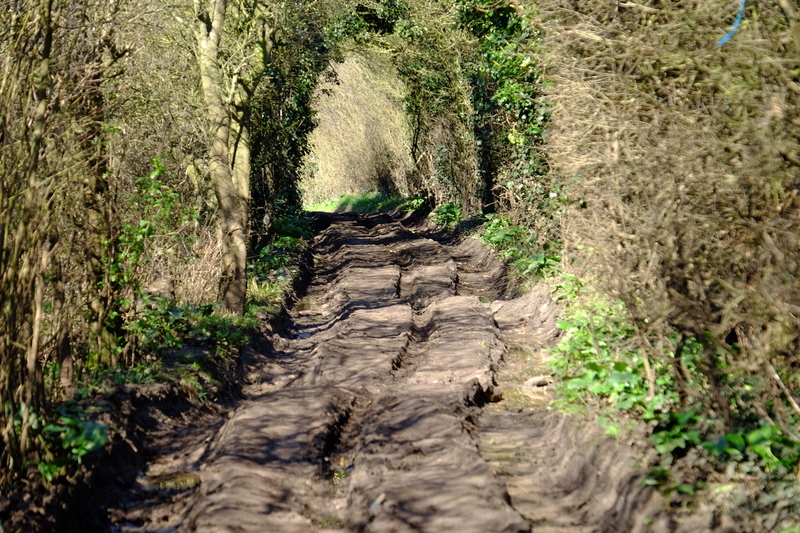 The path was heavily rutted, boggy in places, and made for interesting travel. At one point I had to inch along the side hanging off the branches of the hawthorn bushes to avoid the bog the path had become. When I got to the end of the rutted section I found another large concrete block and a sign. Apparently this section has been closed for 6 months so that they can fix the damaged surface. Alas the sign saying this seems to have gone missing from the other end. I took the opportunity of a seat (the concrete block) to have a snack and a drink. I then filtered some water from a nearby cattle trough before continuing on. The path opened out onto open farmland, you could see from the terrain that this section used to be an trackway used for carts, but hasn’t seen such traffic in years. The fields were lush with green growth. Because of the noise of the traffic on the earlier section, I was walking along listening to podcasts on my headphones. This meant I didn’t hear when the dry bag with my loo roll in it fell off the outside of my pack where I had tied it on earlier. I only realised this as I was approaching the A256. I wasn’t prepared to backtrack to find it, so pressed on. Many shades of green, the lush growth of spring. In need of the loo and to refill my water bottles, I diverted just past the A256 to the Cider Works. It’s marked as a pub on the Harveys Map, but it’s actually a licensed cafe with slightly odd opening hours. I arrived just before the shut at 4pm, bought a slice of cake and an apple juice. They kindly refilled my water bottles. Restocked and rested, I once again moved on. Rejoining the NDW, the landscape changes once again. I crossed through a church yard into pasture, through a small copse and into the lands of a country estate. I wanderd past giant mature trees, timeless pasture, and a country pile the size of which I had not expected. Leaving the pastoral land I crossed into a wheat field that filled a whole valley. 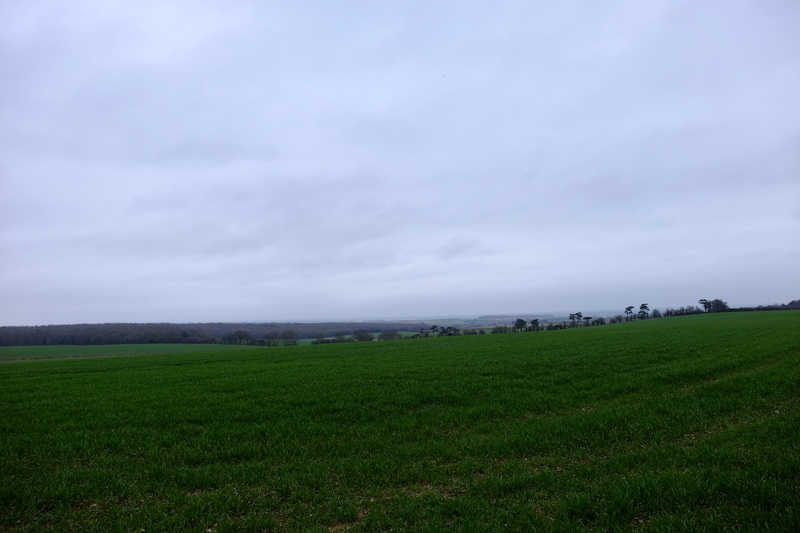 I ascended the other side into a small woodland, then back into farmland for the last couple of kilometres to Shepherdswell. The staff at the Cider works had said that one of the pubs in Shepherswell had recently closed, but they couldn’t remember which one it was. Fortunately the one that is still open is the one nearest the NDW, and I exited the path next to the church yard and into the pub. The Bell Inn, Shepherdswell – A welcome sight. The pub had a small crowd round the main bar area, and the conversation seemed to reduce somewhat as I came in. I walked past them all with my large pack, a couple of them making comments. I collapsed onto a sofa and ordered a pint. Three pints of courage and a delicious fish ‘n’ chips later, I left the pub into the star light. I wandered through the horse pastures of Shepherdswell onto where the NDW joins a country lane heading north. Away from much of the light pollution I had a clear view of the stars, and with Orion on my left, and Cassiopeia on my right, I headed north. Somewhere north of Shepherdswell I left the NDW and found a spot to bivvi in an area of coppiced broadleaf trees. It wasn’t the best spot, but it was away from the trail, had some shelter from an earth bank, and it wasn’t under a Yew tree. Between the exhaustion of the hike, the 3 pints of beer and the cold, I didn’t linger long. I put up my tarp, rolled out the bivvi bag, and crawled in, still fully dressed. It was cold so I wore my Torres jacket inside the sleeping bag. I lay there listening to the local wildlife, something rustled in the leaf litter, and in the distance an owl called. But as I lay there I realised that I was shivering. Actual body shaking shivers. This was not good. I was in a 5°C sleeping bag, inside a heat reflecting bivvi bag, with an insulating jacket inside that. I rooted about in my pack to find the space blanket that was inevitably at the bottom. I unfolded it and put it between the bivvi bag and the sleeping bag. With this in place, I curled up tight and drifted off to sleep. I stretched my sleeping bag out so that it could dry. The DWR coating on the bag had done it’s job and the moisture had pooled on the outside of the bag. It dried quite quickly, and just 45 minutes after I had crawled out of my bivvi bag, I stepped back out onto the trail. 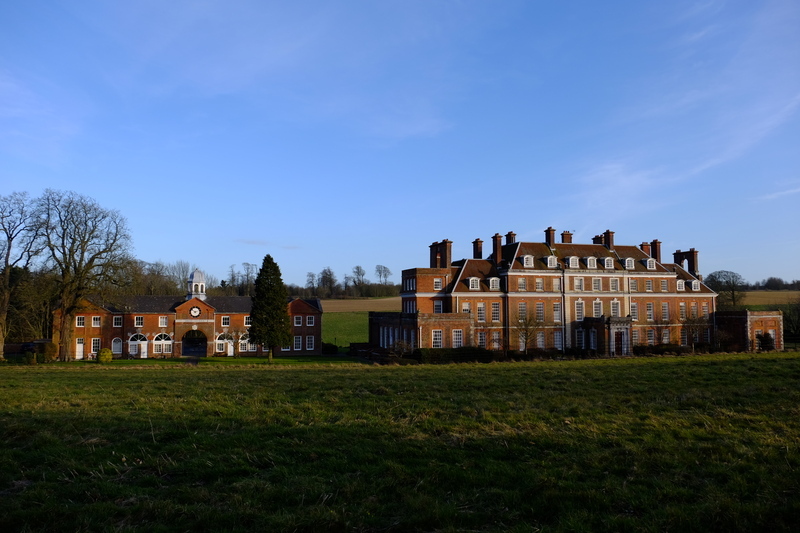 Whilst Friday had been warm with beautiful spring sunshine, Saturday was an altogether chillier and greyer affair. Grey skies looking towards Thanet. From here onwards the NDW passes along side large open fields. 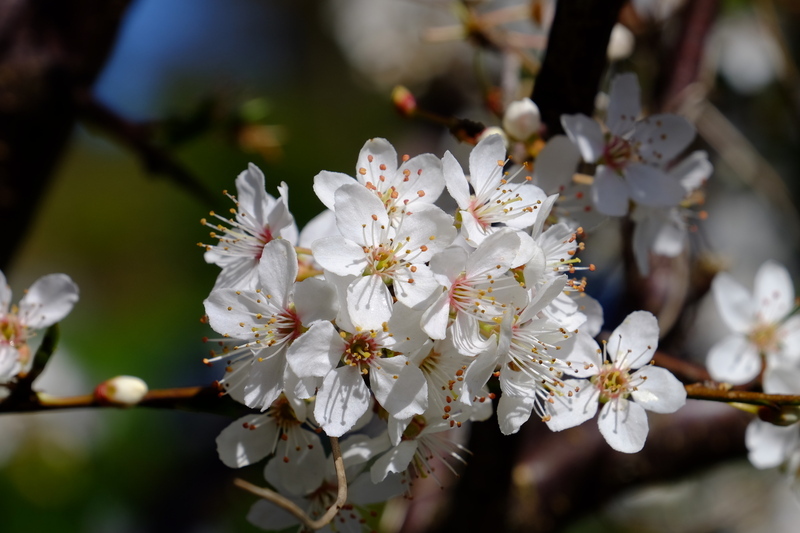 The hedgerows of the previous day were gone, and with them their shelter from the wind. Where the path came close to a road edge, some scrote had fly tipped their rubbish. I trudged northwards. Whilst on Friday I had covered 21.8km and didn’t feel too bad, just 5km into Saturdays hike and my feet were starting to ache. My old injury back with vengeance. I continued on, the pain increasing with every passing kilometre. At Barham Downs I found the field the NDW passes through being ploughed by a couple of very large tractors, taking with it the obvious route through the field. I skirted along the edge where there was another path. On reaching the end of the field I had a small navigational hickup, and stopped to double check using viewranger. Position checked, I found the path a few metres beyond where I had thought it would be, and continued on. Once again the NDW joins a large road, this time following along the A2 for a short section near Bridge. The pain in my feet was getting considerable, and I decided that it would be best if I diverted to Bekesbourne station and the train back to Canterbury. Bekesbourne only has one train an hour in each direction, and not wanting to have to wait 58 minutes on a platform with no seat or shelter having watched a train depart, I pressed onwards. 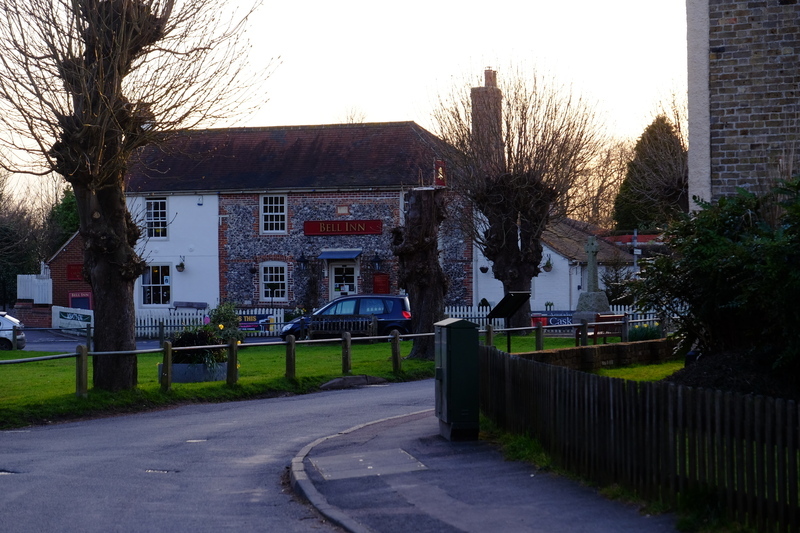 I passed through the pretty village of Patrixbourne, before turning off the North Downs Way into Bekesbourne. As I hobbled along Station Approach, I heard the sound of the approaching train, and with the last drops of will power, broke into a run. The train pulled into the station when I was about 50 yards from the platform. The Guard stepped onto the platform as a handful of passengers got off. The guard saw me and I waved, calling out “please wait!”. The kind guard held the train for me blowing his whistle and closing the door behind me as I stepped onto the train. I collapsed into a seat for the short trip to Canterbury. I’d managed just over 10km today, crossing off most of the NDW between Dover and Canterbury. I’ll have to come back for the final 3.5km. I wanted to have a go at baking bread over an open fire (ideally without resorting to very heavy Dutch ovens). After much research it seemed that dry baking was the way to go. Dry baking is basically sticking one pot inside another with the item you’re baking inside the inner pot. The inner pot is kept from the outer pot by some sort of separator. You can buy dry baking kits designed for hiking, but being on a budget and with most of these being US in origin, I decided to have a go at using stuff I already had. Equipment wise I used two Tatonka stainless steel kettles, the 1.6L and the 1.0L. The recipe was for a simple white loaf. I mixed the ingredients together in the 1.6L pot. In hindsight I put a bit too much water in, which made a very damp mix. Fortunately the friend I was camping with had some spare flour, unfortunately it was self raising flour. After a bit of kneeding the dough was left in the covered pot by the fire for it’s first rise. I was making this outdoors in April so needed the warmth of the fire to get a rise within a reasonable time frame. First rise went pretty well, but it became apparent that 500g of flour makes a lot of bread, I split the dough roughly in half, one half for my experiment and the other half I gave to my camp mate for her to experiment with. Knocked back and with a brief kneed, I left the dough in the lid of the 1.0L pot with a loose covering of foil to keep it from drying out. The dough spent about half an hour next to the fire rising. Second rise after knocking back. While the dough had it’s second rise I built up the fire. It had been burning since breakfast that morning, but I turned the Just A Pile Of Sticks™ fire lay into a log cabin fire lay. The fire wood was seasoned hornbeam approximately wrist thick. The aim was to get a good hot bed of embers. While the bread cooked, I carved a butter knife out of a piece of green hornbeam. After about 40 minutes I took the lid off the outer pot to take a look. It looked like the dough was cooking nicely on the underside, but not fully cooked on the top. I gave it a bit longer while I had a think, before deciding to turn the bread over. I had oiled the lid before I put the dough in, but hadn’t managed to fully coat the rim and the bread was stuck. Eventually with some levering and poking with sticks, I got it separated. Inverted, the dough got another 20 minutes or so. I then just had the slight issue of how to get the bread out the pot without burning myself. After inverting the bread into the lid of the 1.6L pot, then turning that back out onto the ground. The result? One good looking loaf of bread, with a nice hollow sound when tapped. Bread fresh out the oven – Good crust. Slicing the bread through the middle, it was cooked through. Just perfect. The crust was not brilliant, I’d forgotten to score the top of the loaf before cooking. But inside the crumb was lovely. I might not win any prizes on bake off, but for a loaf of bread cooked over an open fire in the middle of the woods. I am pleased. Of course the proof of the loaf is in the eating. Served up with some salted butter, spread with a simple hand carved butter knife, the loaf didn’t last long, disappearing in about 10 minutes. The taste wasn’t the best I’ve ever made, I think it could have done with a bit more salt. But it was certainly tasty enough that it all got eaten. In future I think I’ll use about half the flour and increase the salt. I’m guessing 200-250g of flour is about right for this size pot setup. All in all, tasty fresh bread baked on an open fire, using no specialised equipment, just the stuff I have in my pack, I’m pleased with that. Bread and Butter. Butter knife carved while the bread cooked.